Now back to the soup. This recipe for chunky chicken noodle soup is from my childhood. It can be ready to enjoy in less than 30 minutes if you use prepared chicken stock. 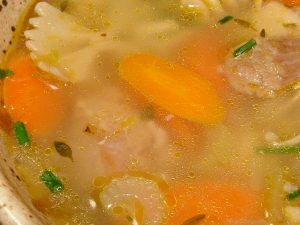 If you buy a rotisserie chicken for dinner the night before, you can make your own chicken stock the next day by boiling the carcass and adding herbs, but this soup tastes great whether you use homemade or store-bought stock. If you really want an easy meal, buy an extra rotisserie chicken and use the meat from that one for the soup….